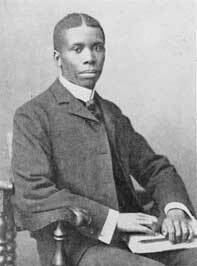 Paul Laurence Dunbar was born in Dayton, Ohio, on June 27, 1872. His father was a former slaveand a veteran of the American Civil War having served in the 55th Massachusetts Infantry Regiment and the 5th Massachusetts Colored Cavalry Regiment. Dunbar's mother was also a former slave. Together, the parents taught him how to read, love learning, and love history. As a student, Paul was the only black child to attend Dayton Central High School. However, the school was open enough that it allowed Paul to serve as chief of the school newspaper, President of the Library Society, and class poet. At age six, Paul Laurence Dunbar completed his first poem. He read poetry aloud for the first time at age nine. During his school years, he attempted to find his own poetic voice. He fell in love with the poets John Keats, William Wordsworth, Samuel Taylor Coleridge, Robert Burns and later John Greenleaf Whittier, Henry Wadsworth Longfellow. Of course, he didn't truly find himself until he started to read about the tails from plantations by Irwin Russell and other authors. Even though Dunbar seemingly excelled in school, he was forced to accept a job as an elevator operator in a Dayton hotel due to racism. At this time, Dunbar began writing vigorously and became known as the "elevator boy poet" after being allowed to read at the Western Association of Writers due to his invitation from James Newton Matthews. His first publication was in a newspaper owned by his high school friends Wilbur and Orville Write. Later, the two published a newspaper for the black community and Dunbar joined them as editor and publisher. After slight success in the community, Dunbar published his first collection of poetry ("Oak and Ivy") in 1892. The work received much attention, especially from James Whitcomb Riley and Frederick Douglas. The poems from the collection included both dialect and standard English. However, it wasn't until his second book, "Majors and minors" in 1895 that he received national fame. Later, he published both books together as "Lyrics of a Lowly Life" and received international fame. At the same time, Dunbar fell in love with Alice Ruth Moore, a fair-skinned Creole teacher and writer. Three years later, the two married. Sadly, shortly after, Dunbar fell ill with tuberculosis and became an alcolholic. In 1902, the couple separated but remained friends. Paul Laurence Dunbar died on February 9, 1906 and was buried in Woodland Cemetery. After Paul's death, Alice became known as the "widow of Paul Laurence Dunbar".